The packaging is fairly bland, as is the case with most packaging destined for the action figure aisles of big-box stores these days. There’s no fancy card art, although the insert with the iconic silhouette and lightning bolt imagery from the comic is a nice enough touch. The logo they’re using to headline the boxes, however, is decidedly unattractive. 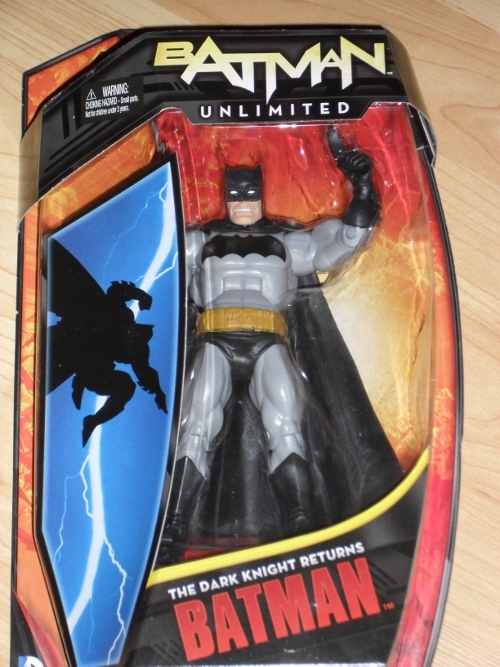 The “Batman” portion is by far the worst in a long line of attempts to shoehorn Batman’s name into the shape of his logo, and the “Unlimited” part looks really lazy and tacked on, like they hadn’t named the line until the very last minute. Which, I suppose, is entirely possible. Why they’re still running with it in wave 2 though, I’m not sure. 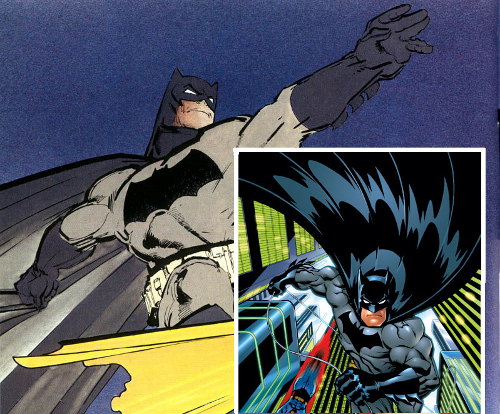 The back of the card features a shot of Batman and future-Robin Carrie Kelley, with a brief plot synopsis of The Dark Knight Returns. None of this matters all that much to me since I’ve opened almost every figure I’ve ever bought, but it all feels pretty bare bones for a $17 toy. The figure itself, thankfully, is much nicer. It’s bulky and solid, without any of the shoddy paintwork or rickety, unstable joints that plagued most of the DC Universe Classics line. Little details like the belt pouches and boot treads are well done, and feel faithful to the Frank Miller designs that inspired the figure. The boots and gloves have sculpted-in creases that look appropriate for Miller’s aging and run-down take on Batman, but unfortunately the wrinkles and folds in the overall costume that have been captured so well in DC Direct versions are lost here. It still looks good, but the end result feels a little like Frank Miller by way of Ed McGuinness. Articulation is good, and doesn’t take away from the sculpt in any area. The “ab crunch” joint even helps with regaining a bit of that hunched-over look that might have otherwise been completely lost in translation. The hip joints are somewhat inhibited by the shorts, but it’s a worthwhile trade-off for having the shorts actually sculpted instead of just painted on. And as with any figure featuring a rigid plastic cape, you’re not going to get much out of incredibly poseable legs anyway. Perhaps most importantly in the sculpting department, the feet are the right size for the body, and the figure stands freely without resorting to a base or endless attempts at meticulously counterbalanced poses. As someone whose toys are all standing on the edges of shelves several feet above carpetless floors, this sort of stability is key. My only major complaint is that the figure’s only packaged accessory is a lone Batarang, molded from the sort of limp, ineffective plastic that is permanently bowed before even taking it out of the box. For $17 it doesn’t seem like asking too much for Mattel to include a grappling gun or something, but if all you’re going to throw in is a single tiny Batarang, at least make it less sad. It’s a shame, because the left hand is actually sculpted in such a way as to hold the weapon really well, but from most angles the droop is really obvious. All in all though, this is a really nice figure, as evidenced by my immediate impulse buy. I didn’t already have any sort of “old man Wayne” figures in my collection, so this fills that spot nicely and does fit in better with what I already have than the more faithful but often statue-like representations from DC Direct. I seriously doubt they will, since the character is both Robin and a girl, but if Mattel were to make a Carrie Kelley figure in this line, I’d definitely buy it. And since she’d require very little plastic in comparison to other figures, it should be easy to budget in a few extra accessories for Batman along with her slingshot. You hear that, Mattel? It’s a good plan. Sell me two things. 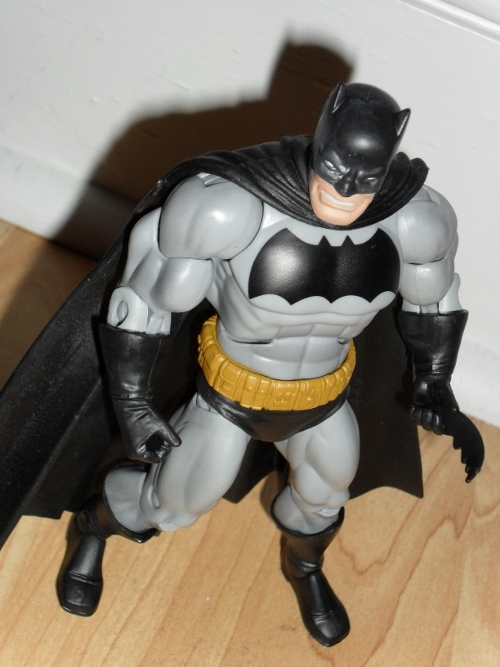 Posted on May 15, 2013, in Reviews, Toys and tagged Batman, Carrie Kelley, DC, DC Universe Classics, Frank Miller, Mattel, The Dark Knight Rises, Unlimited. Bookmark the permalink. 2 Comments. I’ve never read DKR, but I was looking forward to this Batman because he’s as big and articulated as MOTUC and even shares a few parts with them. I’m not sure I’ll ever SEE him though, since the stores near me either don’t bother carrying non-movie DC figures anymore, or are still sitting on the ones from a year ago. Mattel loves to cheap out on accessories. 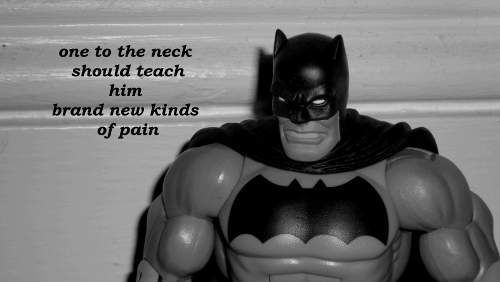 I wouldn’t be surprised if that Batarang came out of a mold from 10 years ago. It is slightly bigger than most of the tiny plastic Batarangs I’ve had come into my possession, but yeah, I wouldn’t be surprised if it’s reused from somewhere. I thought these were MOTUC parts but I wasn’t sure, having never opened the two I bought before I sold them again. Good idea on their part, using that body type. I’d like to see a Bane figure done the same way.